Soooo…yeah. I’m not even sure what else to tell you about these cupcakes. I think the pictures and the name pretty much speak for themselves. 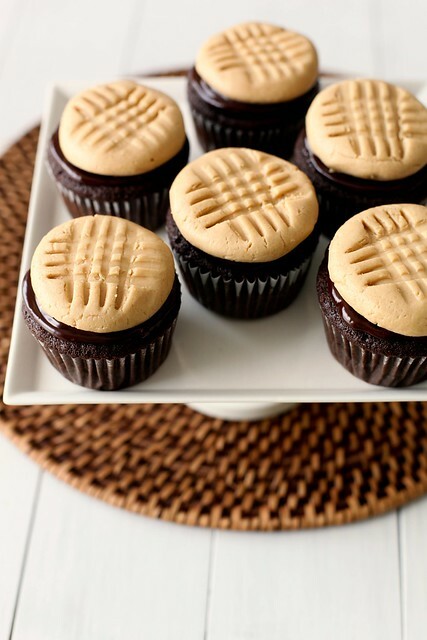 A perfect chocolate cupcake topped with ganache and “frosting” that looks like a peanut butter cookie, has a texture similar to the filling of a buckeye, and tastes amazing. That’s everything you need to know. Make them this weekend. Yes! Okay, so here’s another thing you really need to know about – the lovely, wonderful cookbook these cupcakes came from. 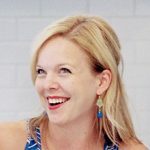 My friend Alice is a fellow blogger at Savory Sweet Life. Her blog has been a favorite of mine for a long time for the beautiful photography and reliably outstanding recipes. When I heard she was publishing a cookbook, I was stoked. When she asked if I wanted to review it, I was even more excited. And then when I received the book, I immediately paged through it to find that I wanted to make about 98% of the recipes in it. I actually did make three recipes within two days of opening the book, and are you really surprised that cupcakes were one of them? There are a lot of things I love about this cookbook. I could go on and on, but I won’t. I’ll hit the highlights for you. First, I really like the category layout of this book. Instead of being separated into appetizers, main dishes, sides, etc., Alice has organized the recipes by occasion – for example, Sunday Mornings, Lunch Between Friends, Block Party, Potlucks, etc. Since I am very fond of entertaining, I appreciate the emphasis on what dishes would work best for various occasions. Second and probably most important, the recipes are mouth-wateringly yummy. All the dishes are irresistible and inspired without feeling like they are trying too hard. And of course, I would be remiss if I didn’t mention the stunning photography. Alice’s photos portray the flavor and beauty of the dishes while still keeping them real and approachable. The pages are studded with photos of her lovely family, which I of course love, being totally enamored with my own little family. This cookbook is exactly what Alice intends – delicious recipes for everyday occasions. Sound like a cookbook you want to own? Good, because here’s your chance! Head on over to the giveaway page to enter. And if you had any doubt that this is a cookbook you need in your collection, just make the cupcakes and I’m sure you’ll be convinced. To make the cupcakes, preheat the oven to 350˚ F. Line cupcake pans with paper liners. In a bowl or liquid measuring cup, whisk together the hot brewed coffee and cocoa powder until dissolved. Set aside. In another bowl, whisk together the flour, baking soda, baking powder, and salt. In the bowl of an electric mixer, combine the butter and sugars. Beat on medium-high speed until light and fluffy, about 3 minutes. Blend in the eggs one at a time, scraping down the bowl as needed. Blend in the vanilla. With the mixer on low speed, add the dry ingredients in three additions alternating with the coffee-cocoa mixture, beginning and ending with the dry ingredients. Mix each addition just until incorporated, being careful not to overmix. Divide the batter between the prepared liners, filling each about two-thirds of the way full. Bake about 20 minutes or until a toothpick inserted in the center comes out clean. Let cool in the pans briefly, then transfer to a wire rack to cool completely. When the cupcakes are cool, make the ganache by placing the chopped chocolate in a small bowl. Bring the cream to a simmer, pour over the chocolate, and let stand about 2 minutes. Whisk together until a smooth ganache forms. If needed, let cool briefly at room temperature to thicken slightly before using. To make the peanut butter cookie frosting, combine the peanut butter and butter in the bowl of an electric mixer and beat on medium-high for 1 minute. Turn off the mixer, add in the confectioners’ sugar and mix on low speed until fully incorporated. Increase the speed to medium and mix until smooth, about 2 minutes. Scoop about 1 tablespoon of the peanut butter mixture and use clean, dry hands to form it into a patty. Use the tines of a fork to make the classic crisscross pattern on top of the “cookie”. Repeat with the remaining peanut butter mixture. Use an offset spatula to spread a layer of ganache over the top of each cupcake. 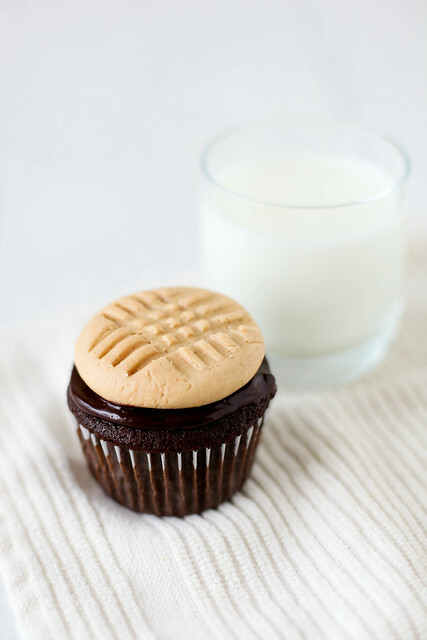 Place a peanut butter “cookie” on top of each cupcake.